Colleen Toledano is a studio artist from Chicago, Illinois and an Assistant Professor of Art at Chicago State University. She holds a MFA in ceramics from Ohio University. 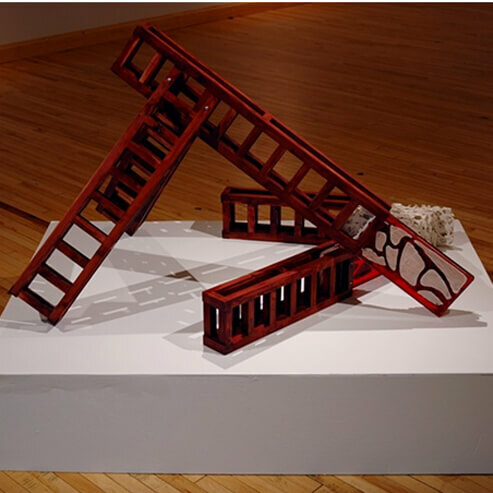 Colleen’s complex and thought provoking work is powerfully influenced by the recognition of out society’s yearning for building revitalization and body improvements. Creating iconic objects of building construction through the manipulation of clay she speaks about the importance of self-improvements as a means to one’s own personal control and power. Most recently she was a resident artist recipient of the Evelyn Shapiro Foundation Fellowship in 2008 at The Clay Studio in Philadelphia, PA. She was the 2005 Philip C. Curtis Artist-In- Residence in Ceramics at Albion College, Albion, Michigan. Her work has been exhibited in Winter Solstice IV, both at the Westchester Arts Council, White Plains, New York and The Studio: An Alternative Space for Contemporary Art in Armonk, New York. She has also exhibited at The Clay Studio and the Mutter Museum in Philadelphia; Afif Gallery, Philadelphia; Kasia Kay Art Projects in Chicago, Illinois; and the Millard Grand Project, St. Pancras Chambers, London.